Close-up of a trifoliate leaflet of Poison Ivy (Toxicodendron radicans) to the left, climbing the same tree trunk side-by-side with a leaflet of the similar looking five-parted leaflet of Virginia Creeper (Parthenocissus quinquefolia). The two native North American vines are only distantly related but often mistaken for each other. 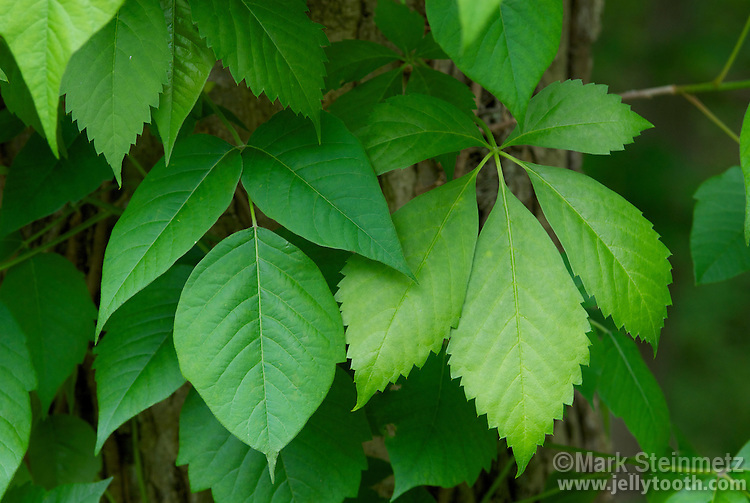 The Virginia Creeper is usually harmless to humans, but Poison Ivy produces a severe rash upon contact with most people.